Hello! A friend of mine asked if I might be able to make some baby shower invites. She showed me a picture of a printed invitation that her and the mother to be were drawn to and this was my interpretation:) I used the colors they really seemed to love as well as the little birdie theme. The inside will say a shower for such and such and her "tweet" baby girl. So cute! I used a couple of images from the My Cute Stamps set Elegant Birds and a sentiment from the Verve set To the Moon. I cut the shape of the onesie with my PTI Onesie Die~LOVE! and the dp is from the Making Memories Wedding Collection. The flower was made with my MFT Die-namics Mini Rolled Roses. I hope they like it! Well I gotta get to bed! Thank you so much for stopping by and have a wonderful Sunday! 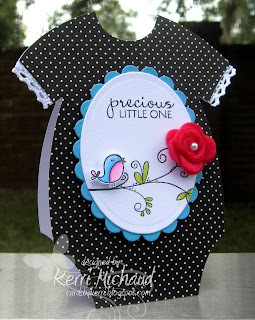 How very cute is this...I love the invite Kerri, really lovely idea. This is beyond precious. Love the use of the black. You don't see that often for baby shower invitations, but it works wonderfully! Oh such sweetness! 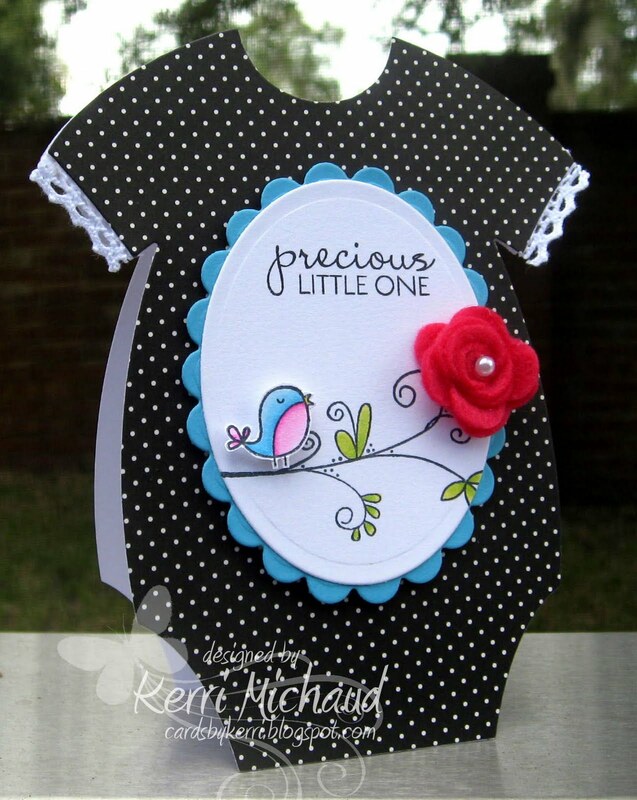 A shaped card is perfect for a baby shower and I like that yours is elegant and still sweet - great mix! What a cute creation Kerri, so sweet and a wonderful shape. this is a really cool invite! love it! Perfect for a baby shower invitation! Love it! Now this is just as sweet as can be girl!! :) Love the onsie and that sweet little flower!! Oh my this is the CUTEST invite..I so love the polka dots! That is the cutest invitation ever!